A case of supra-pubic lithotomy for encysted calculus of large size; successful removal by means of the chisel and mallet. Journal : Transactions of the Clinical Society of London, vol. 22. London : Longmans, Green, and Co., 1889. Description : pp. 32-35 ; ill.: 1 photo. ; 22 cm. Photograph : in-text photograph of the specimen (process unverified). Subject : Bladder — Calculi; Suprapubic lithotomy. Author caption: By E. HURRY FENWICK. Read November 9, 1888. Surgeon to the London Hospital. Surgeon and pathologist to St. Peters Hospital for Stone and other Urinary Diseases. Reference: W. Rivington (1886), Transactions of the Royal Medical and Chirurgical Society, vol. lxii (p. 370). Co-president of the International Association of Urology (1911). 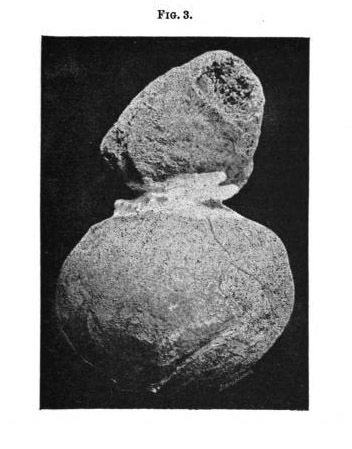 A large dumbbell shaped calculus is depicted, 7 inches at its furthest circumference, reassembled with plaster patches after it had been broken-up and extracted from the subject's bladder. For this operation, Fenwick followed Rivington's procedure, using a chisel and mallet (supra cit). Fenwick won the Jacksonian prize in 1887 for his essay titled, Tumour of the bladder. He was an early adopter of cystoscopy and x-ray technologies in treating disorders of the bladder and it was through his efforts that urology was shaped into a specialty recognized by the Royal Society of Medicine.